In either case, you should know skydiving planes are often quite different from the aircraft typically used in civil aviation operations. For starters, skydiving planes are under the umbrella of General Aviation: a catchall term for flights made using gliders, powered parachutes, or private jets and other non-scheduled air transport operations for hire. Not up to speed on all things aviation? Don’t worry. We plan to get you well acquainted with your skydiving plane before you make a skydive for the first time. Here’s what to expect on your flight up to altitude in a small plane. The seating situation may be one of the first things you notice on a skydiving plane. On commercial flights, there are individually sectioned seats often arranged in rows of two or three. Capacity wise, commercial airlines often use aircraft that seat anywhere from 170-500+ passengers. 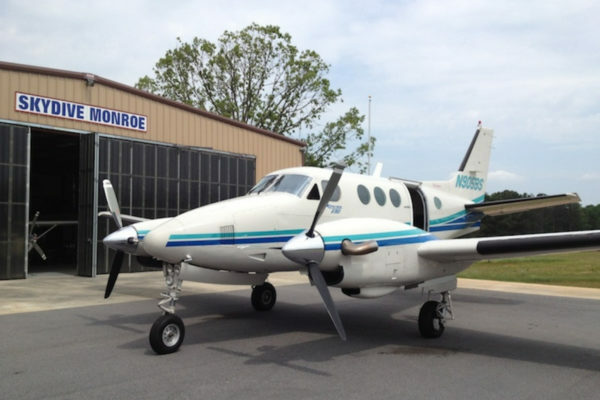 At Skydive Monroe, our aircraft fleet contains two different skydiving planes: a King Air and a Cessna 182. Not including the pilot, the King Air has a capacity of 14 passengers, and the Cessna 182 has a capacity of 4 passengers. Instead of following a letters-and- numbers grid to your seat, on a skydiving plane, you will be directed by your instructor to snag a seat on the bench, or sometimes, to grab a seat on the floor. Floor seating in a skydiving plane has a functional application: although it seems bare bones, it keeps the plane as light as possible and lighter planes fly more efficiently to get you to skydiving altitude more quickly. Skydiving planes are smaller than their commercial airline counterparts. While riding in a larger heavier airplane, say a Boeing 747 jet airliner, you are less likely to notice the dynamics of the air. On smaller aircraft, like our Cessna 182 or turbine King Air, you more readily notice the regular movement an airplane experiences in flight. During your ride to altitude, you are more likely to feel the effect of various air currents and the slight dips and bumps of turbulence as well as the corresponding flight adjustments that the pilot makes. Don’t worry, it’s all part of the tandem skydive experience, and, when you think about it, it’s captivating to realize just how active things are in, what may appear to be, a placid, tranquil sky. 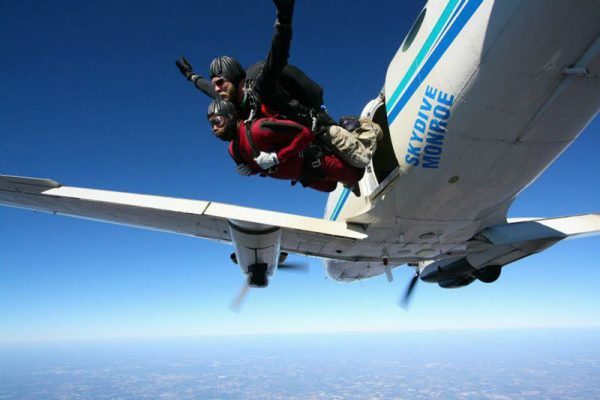 We are willing to wager your skydiving flight will be one of the quickest rides of your life. Our zippy King Air can cruise to an altitude of 14,000 feet in under 10 minutes, and it’s a good thing too, because your skydiving plane ride is going to be tight and cozy. 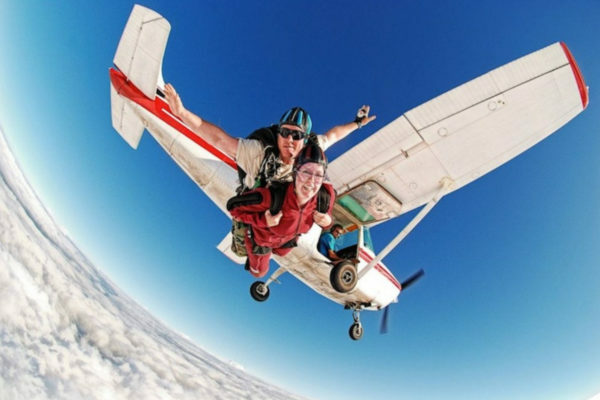 On a skydiving plane flight, you’ll be filled with excitement and anticipation, rubbing elbows with your neighbor and tucked in with your instructor. Don’t let the close proximity bother you. The close quarters keep the energy palpable and put you within high-fiving distance of everyone involved! Don’t forget to flash a smile and hand-out (get it!?) a few high-fives before you find yourself high-flying on a skydive! Now that you’ve read about it, experience it all first-hand. Book your flight on one of our skydiving planes today!